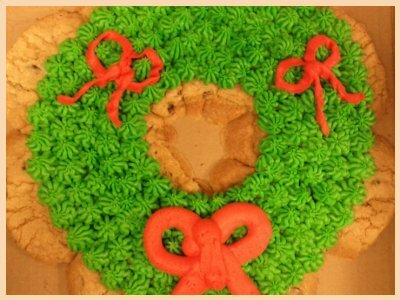 Available only during the holidays, this massive 12-inch Wreath Cookie is made with our Chocolate Chip cookie as a base and decorated with fresh Buttercream Icing. We can customize the colour of the bows to your taste. A wonderful surprise for any party, and delicious too! Looking for something smaller for easier sharing? How about some Wreath Cookies?